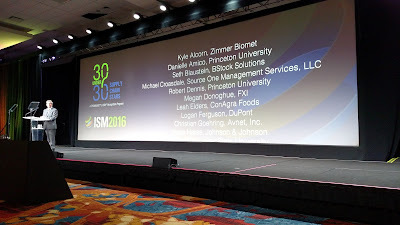 Last night, the Institute for Supply Management and ThomasNet officially celebrated this year's 30 Under 30 Rising Supply Chain Stars! The networking event brought together the winners, including Source One's very own MRO Category Expert, Michael Croasdale, who are making a difference in supply management. The reception is a part of the ISM Annual Conference's Emerging Professionals track that also includes a special 2-hour CPSM Session focused on test one, Connection Reception- a private event with senior-level executives, and the CPSM exam one testing. Source One's Michael Croasdale is recognized as a 30 Under 30 for his implementation of an innovative preferred supplier program for a construction client. In addition to saving the firm $1.2M, Croasdale established a new ordering guide that leveraged Google Earth. The new guide allowed purchasers to find suppliers based on the location of the job site- cutting transportation costs and easing the adaption of the new program. During the event, ThomasNet caught up with Croasdale to get his thoughts on being a young professional in the supply management field. He shared "It’s great seeing how much of a financial impact you really have on a company, reducing costs for both direct and indirect materials." As for his advice for those interested in a procurement career path? "You have to work hard but advice for them is, if you put your nose to the grindstone, you're going to get where you want to go." Croasdale explains.